Providence's zoo is situated in a beautiful 174-hectare (430-acre) Victorian park accessed from Elmwood Avenue on the south edge of the city. The Roger Williams Park Zoo focuses on conservation and also contains two other popular attractions, a museum of natural history and a planetarium, as well as offering a relaxing spot to picnic, feed the ducks, ride a pony, or rent a paddleboat. The zoo is home to more than 900 animals from 156 different species, with display areas divided into different habitats, including Tropical America, the Plains of Africa, and Australasia. 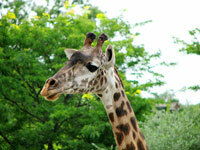 Animals on exhibit include cheetahs, elephants, snow leopards, red wolves, bison, and many more. Special features include an exhibit focusing on survival and adaption, as well as separate environments illustrating the natural worlds of both Africa and North America. There is also a wetlands trail, a mini trek reproducing the journey of Marco Polo, and an upcoming rainforest exhibition. Opening times: Daily 10am-5pm (closes 4pm October to March). Admission: $17.95 adults, $12.95 children 3-12, $15.95 seniors.